Gold and silver futures declined modestly Monday. Platinum and palladium advanced. Precious metals futures were mixed in their start to the new trading week on Monday. Platinum and palladium climbed while gold and silver retreated. Slipping from a 13-month high, gold for April delivery declined $6.70, or 0.5%, to close at $1,264 an ounce on the Comex division of the New York Mercantile Exchange. 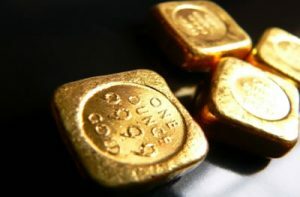 Gold prices ranged from a low of $1,257.40 to a high of $1,274.10. "Gold prices ended the U.S. day session modestly lower Monday, on some profit-taking pressure from recent gains," Jim Wyckoff, a senior analyst at Kitco Metals Inc., said in a report. "Bulls remain in firm near-term control as prices are trending higher and hovering near last Friday’s 13-month high." Gold futures surged last week by 4.1%, closing on Friday at their best level since Feb. 2, 2015. Silver for May delivery fell 6.1 cents, or 0.4%, to settle at $15.633 an ounce. Silver prices traded between $15.49 and $15.83. They rallied 6.7% last week. April platinum rose $15.70, or 1.6%, to $1,002.00 an ounce, ranging from $976.90 to $1,011.10. Palladium for June delivery gained $14.60, or 2.6%, to $577.60 an ounce, trading between $552.50 and $578.10. Last week, platinum gained 7.8% higher and palladium jumped 16.7%. Gold declined $9.60, or 0.8%, to $1,267.90 an ounce. Silver added 23 cents, or 1.5%, to $15.66 an ounce. Last week, London bullion prices registered increases of 4.2% for gold, 1.7% for silver, 3.4% for platinum and 11.8% for palladium. United States Mint bullion remained unchanged following steady gains last week. The U.S. Mint is rationing Silver Eagles because of silver planchet shortages. Earlier Monday, the agency announced its latest weekly allocation at 1 million coins, matching last week’s amount.